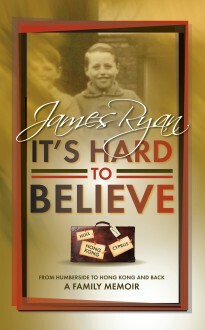 James Ryan was brought up on Humberside between the wars. After post-war army service in Germany he embarked on a career in signals intelligence which took him to Cyprus for three tours and then to Hong Kong for another two tours. On demob leave from the army he met a girl called Barbara, and they are still happily married 62 years on, with five children, 18 grandchildren and two greatgrandchildren. ‘It’s Hard to Believe’ is the Ryans’ story.